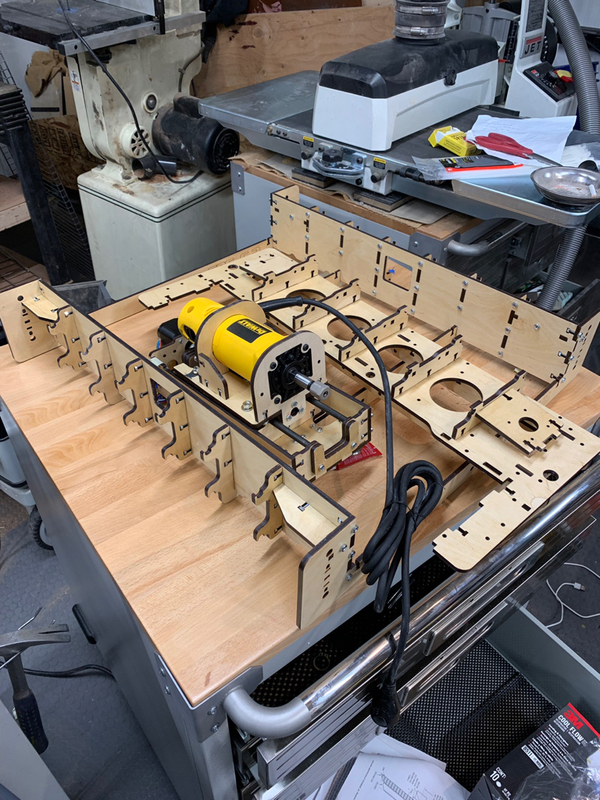 Well, I just ordered Bob’s CNC kit on amazon. I’m hoping to be able to cut risers and accents consistently, and I’ve thought about employing a cnc mill for awhile. So when I stumbled across one that gets decent reviews for under $700, I called and talked to Bob. After explaining what I wanted to do with it, he seemed to think it would easily do the job, as long as I’m not in a big hurry. We’ll see how it goes. Anybody have any experience with any of the software for this application? I understand there are lots of open source options that are free. Do you have to write a program or is it like a copy crafter thingamajig? You should at least be able to program and cut out jig profiles that can be used on a profile sander. Is this a stand alone tool or an add on to an existing machine? I work communications technology for the Army; satellite communications is my specialty, but I can get around computers okay. The kit comes in today. The way I understand it, it includes the router, controller, all the hardware that’s necessary for the router to cover an 18”x15” bed (included, but made of thin plywood). It has a depth capacity of 3.5” or about that. The software is open source. I read up on some of it today. Essentially, you can use any drawing, 3d, or cad program to create your design in the form of a JPEG image. There is another program you feed the image to (in this case the riser shape from the template and/or cutouts for accent work). It takes the lines and references the coordinates on the cutting table on all three axis (sp? Axes? Axii? You know what I mean... 3 of them. X, Y, and Z is height. It generates a text document that feeds the controller the coordinates in a specific format. You start the router at 0,0,0 x, y, and z, and then it goes to town. They recommend cutting about 1/16th” depth on each pass, so that’s about 32 passes for 2” stock, and a feed rate of 20” per minute. But you don’t even have to do anything once it gets going. I talked to Bob himself for quite awhile. I sent him a picture of a finished riser I grabbed online as an example. It was a pretty damned intricate 3 piece takedown riser, and he said it could do that. He said it would be difficult, but he was talking about all the shaping-contours for the grip along the side. When I explained that I would just want the outline (belly and back surface) cut to shape accurately, along with any accents I’d be cutting from another piece, he said it would handle that no problem. Limitations being the size of the work surface, which is adequate for any riser you can fit in there diagonally (there’s a bigger one for a couple hundred more that’s 24”x24”). Also, the bit sizes are 1/8” and 1/4”, so a minimum of 1/8 kerf loss. Potential seems pretty much whatever you can imagine for shapes. I think the 24” one could even be used to perfectly generate a limb profile template straight from one of the force draw calculator spreadsheets. Not to mention cool stippling, shapes that can’t be made accurately even with a jig... little pictures of deer etched into the riser and all o that. It might be kind of cheating, I don’t know. I’m really starting to enjoy the build process. It’s one of the few things that’s every bit as gratifying as I had hoped it would be, even after years of build up. I’ll let you guys know how it’s going when I get the kit. I’m skeptical; the price is way lower than I would expect. More to follow. Interesting stuff. I can't foresee myself making the investment but nevertheless I'm quite curious. I don't see it as "cheating" any more than using a profile sander. The creativity is in the design, IMO. I interested as well. I have access to a CNC machine at the Woodworking Club. We use Veritic software. I used a jpeg photo of a woodland scene and created the program for the machine. Then we went to the Veritric site and converted it to the binary language of the CNC machine. So I am thinking why not a riser? Latest update: squeezed out a little time this evening (all night) and got this far on the cnc build. Hope to finish after some sleep. Damn Mike, thats a very cool tool. I imagine it has all kinds of potential. With a longer bed, you could make some precision tapered laminations with that thing. Profile a bow blank. Who knows what else. I’m not so sure this one is really going to be durable enough to be useful for production, but what I’m thinking is that I should be able to make perfect templates for risers, accents, and overlays of pretty much any design I can think up. When I’ve got that edge sander modification done, I’ll be able to put those templates to heavy use. Then when I know enough to start tweaking my own bow designs, I can make a perfect press template using a technique called “tiling” which would allow me to make things that are several times larger than the bed. They do have a 24” x 24” model that’s only a couple hundred bucks more. I think I’d have to put down a few grand if I wanted to use it to do production. It will cut all the way through a riser blank, though, at 16 passes per inch. It just seems like that would put some wear and tear on the little sucker. I think I’ll try to make a bow using it to do the heavy lifting at first, though, just to see how it handles it. 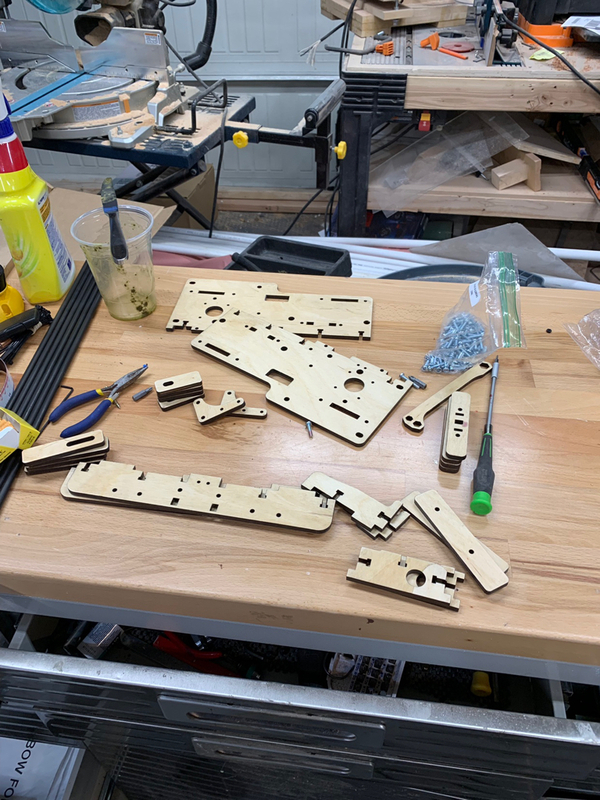 "I’m not so sure this one is really going to be durable enough to be useful for production" It appears to be a little chincy no doubt and looks like a jig saw puzzle. Got it finished and homed. Had some trouble with the polarity on the motors; the instructions had the x and y axis motors polarity reversed. That wasn’t cool; put this sucker together to have it slam against the opposite side and fight the drive belts until it erred out. Once I got the polarity right, it operates really smooth. I hit the pieces with a few wood hardener treatments and a clear water borne poly before I assembled it. It was like a crazy jigsaw, but now that it’s put together it feels pretty solid. New toys are fun! Been playing with it yet? There is a guy turning out CNC shaped flintlock stocks and kits that are miles above any other kit gun stocks ever produced. He has trouble with buying consistent metal castings of triggers and other parts and has just started turning them out on his CNC machine. 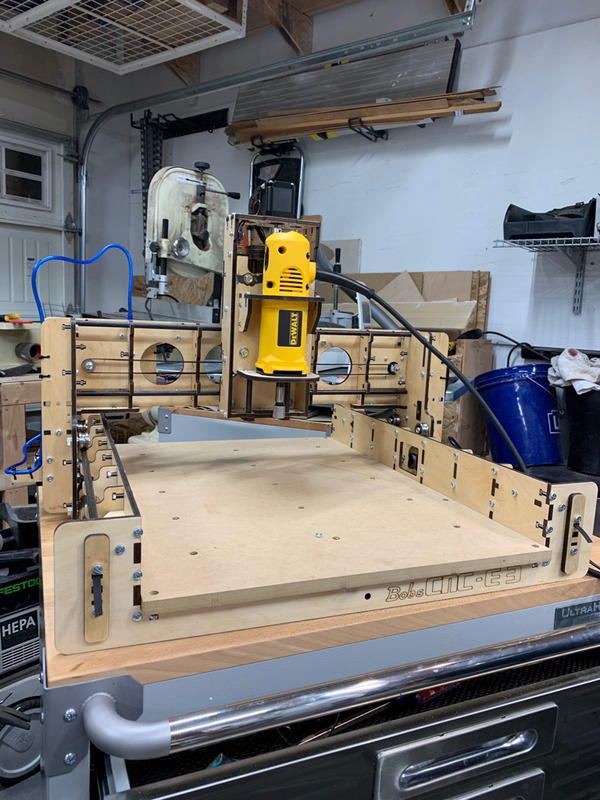 He was forewarned not to ever show a picture of his CNC set-up because others will copy what they see and become competition, he has the market cornered now. The precision he gets out of his machines is incredible, I suspect the CNC shaped bow risers will be as well. Haven’t played with it yet; my dog stepped on something and cut the artery in his foot. The porch looked like a murder event. Got him all stitched up. Hopefully I can start playing tonight though. Hope the dogs gonna be ok.
Roy, he’s good. I got him to the EV in time, and it was a clean cut. They were able to get him fixed up, and he should retain mostly full mobility. They don’t know about the nerve, but he don’t need it. He’s getting up there in age; he’s a ridgeback, 10 years old, weighs about 100lbs, but he’s healthy as a horse. I’ve had him since he was 4 weeks old. Any ideas how a feller could put this thing to work on limbs? Either a profile template or something? I’ve seen the decorative inlays they do at blacktail, but I’m hoping to come up with a way to improve the way the bow shoots first, and I’ve had a little trouble with tillering consistently. I’ll get it, but I wonder if this could help with the initial shaping.